Nature has published a comprehensive list of the top 100 most highly cited papers of all time and the list is well worth a look for what it reveals about what's really important in science, what people perceive as being important and in fact how science progresses. I like the list because it confirms something that I have written about on the blog a few times: science is as much a tool-driven revolution as an idea-driven one. This is evidenced by the fact that almost all of the most highly cited papers in that list are about useful techniques rather than great ideas and discoveries. Thus the expansion of the universe, the structure of DNA and the theory of relativity don't rank on the list but Sanger's gene sequencing method, an algorithm for comparing protein and DNA sequences (ClustalW) and a popular statistical technique do. And the dominance of many of these came about because of computers, so the selection also speaks very highly to the rise of computer technology. Now one can argue that the reason the structure of DNA does not rank on the list is because its importance is so obvious that it has become a textbook fact and does not need to be cited. This is true, and the list does nothing to denigrate the significance of such household ideas (and it also does not elevate the importance of tools above ideas). But what it does convey is that the really visible papers are those which gave researchers practical tools rather than profound ideas. It also tells us that what's in the textbook is not always what's used the most by scientists in their day to day work, even if it may be an important component of their background knowledge. The selection is dominated by papers from protein biochemistry, bioinformatics and statistics. The most highly cited paper documents the use of the Folin phenol reagent which even researchers consider a "tad outdated". This big enchilada leads the pack with a whopping 305,000 citations; the next best paper with 213,000 citations is a dot on the horizon by comparison. The genomics revolution meant a huge unmet need both for methods to quantify, isolate and sequence biomolecules and to process, compare and analyze these sequences. Not surprisingly, specific lab protocols for isolating and studying biomolecules and computer algorithms for analyzing their information content rank at the top of the list. The latter phenomenon is a great example of two technological revolutions - cheap software and hardware and the applications they engender - piggybacking on each other. Statistics and crystallography - two other disciplines with huge practical ramifications - also feature prominently on the list. Computers were again tremendously important in the practical realization of these disciplines. For instance the program SHELX made it possible to analyze complex diffraction data from x-ray diffraction. Similarly the original paper describing the Kaplan-Meier test is highly cited: today the reason the Kaplan-Meier test is so popular is partly because it has found critical use in fields like clinical trials, but more importantly because it has been incorporated in popular software tools like Matlab and R which even non-statisticians can use efficiently. As statistics becomes more user friendly it is likely that these papers will be even more highly cited, but the people who cite them might just be using their products the way a gardner uses a lawnmower without really understanding how it works. Computational chemistry also makes an appearance and density functional theory (DFT) which has caused a revolution in the accurate and fast calculation of molecular properties is what raises the profile of the field. The two most highly cited papers in this area include one by by Lee, Yang and Parr and another by Becke. The interesting thing about the amalgamation of these two methods is that they have now become ensconced in an abbreviation (B3LYP) which is used as part of a recipe by thousands of graduate students, postdocs and professional researchers to do all kinds of quantum chemical calculations, from simple energy determinations to complex reaction studies. But the prominence of B3YLP also goes to the heart of the reason why a paper can be highly cited: it becomes so firmly enmeshed into a standard arsenal of tools that most people start blindly citing it and using it as a black box. I have used the technique myself dozens of times including in a few papers, but I don't remember the last time I took a look at the original paper. One of the most puzzling facts about the list is the almost complete absence of papers from physics and astronomy. Maybe I am missing something here but the absence tempts me to reiterate something that I have noted before: that chemistry and biology, much more so than physics, are about tools rather than ideas. Nonetheless I find the paucity of physics papers puzzling since there is no reason a priori why physics should be devoid of practical tools nor why ideas in physics should not be highly cited. One intriguing point noted in the article is that physicists might be less prone to citing each other's papers than biologists, and if true this is really a cultural phenomenon responsible for the absence of physics papers on that list. Nevertheless the list is quite readable. It tells us that science is ultimately as much about the mundane use of tools and techniques as it is about the genesis and distribution of profound ideas. Sadly the former view is not half as much appreciated by the general public as the latter. The list provides a great counterpoint to the idea of science as a series of paradigm shifts. It tells us that in science, as in many other fields, what matters ultimately is what we can use. "Atticus Finch goes up to the counter and orders the one drink on the menu that no one else was brave enough to get. As he walks out, everyone else stands up in solidarity." Naturally (yes, naturally) this got me thinking about what certain physicists would utter if placed in the same situation. Newton slowly walks up to the counter and is thinking of ordering some biscuits instead of a drink. Before he can say anything he sees a few biscuits in the display window named "Leibniz". He grows red in the face, curses loudly and storms out. The portly Pauli waddles up to the counter and offers up a precise description of ingredients which he wants in his exclusionary latte. The barista furiously scribbles the order and makes the drink. Pauli takes a sip and screams "This is not even bad". The barista tries to stammer an excuse. Pauli puts both fingers in his ears and runs out. Dressed in his impeccable bow tie Schrodinger elegantly walks up to the counter. First he orders a caramel macchiato, then switches to a green tea latte, then contemplates a pumpkin spice drink, then reverts back to simple coffee, then finally asks that the barista make him a drink with a superposition of all possible ingredients in the coffee shop. When served this drink he takes a sip and throws up. Bohr walks up to the counter and mumbles his order. When the barista says she didn't understand, he repeats the order with a different version of mumble. When this happens three times he retreats to the corner and sits there smoking his pipe and mumbling to the stranger next to him. Dirac hesitantly steps up to the counter. The barista asks him what he would like. Dirac asks him what's on the menu. The barista spends about five minutes describing the several offerings. Dirac finally asks for a cup of water and leaves. Einstein orders a tall vanilla latte. When he takes a sip he feels obliged to point out to the barista that it's the worst drink he has ever had, and that includes the "English" tea served at the Institute for Advanced Study. The barista drily points out that taste is a very relative thing. There's not much Einstein can say to this and he retreats to a corner seat, trying to smile and look sage-like but fuming inside at being hoist by his own petard. Feynman walks in with a pair of bongos and makes such a din that he is indignantly asked to leave. Five minutes later he walks out of the cafe with two free macchiatos, and the baristas have no idea what the hell happened there. Szilard walks up to the barista and asks her if they have a pastrami sandwich. The barista says they do and quickly realizes it's a bad idea when Szilard likes the sandwich so much that he lodges himself into a comfortable chair and refuses to leave even when the cafe is about to close. He says this is where he is going to live for the next one month. Fermi walks up to the counter and offers a very precise description of his drink. While the drink is being made Fermi comes up with a theoretical formula to maximize the taste and flavor of an arbitrary caffeine-based beverage as well as a new, cheaper and more efficient design for the espresso machine. He is offered a job as manager on the spot. Hawking whirs around to the counter in his electric chair and orders up some English breakfast tea in his digital American accent. For some reason the baristas are all looking very offended and seem reluctant to serve him his drink. It doesn't take long for Hawking to realize the reason - for the last few minutes he has been saying something to his scientific colleague about a "black hole with no hair". Looking erudite and self-important Gell-Mann ambles up to the counter. He only seems interested in two qualities of the drinks in the cafe - flavor and color. After picking his favorite combination of the two he proceeds to correct the baristas' pronunciation of every item on the menu as well as their own names. Witten orders his usual grande chai. 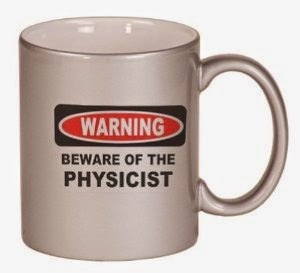 And he ends up being the only one among the physicists who offers unadulterated praise for the drink, saying that it excels in every possible dimension. The Nobel Prize-winning physicist Robert Laughlin is one of those rare minds who combines a wide-ranging knowledge of many fields with a wicked sense of humor and a devil-may-care attitude. This combination of gifts is on full display in his wonderful book "A Different Universe", a volume that at its heart is about the limitations of reductionism in physics and the manifestations of emergence but which tends to gambol around a remarkable variety of topics ranging from politics to scientific personality with cheerful barbs and a constant sense of wonder about what we don't know about the human and the natural worlds. In the book is contained a gem. Laughlin imagines what Mary Shelley's Frankenstein would have been like in the modern age of cut-throat federal funding, media frenzy and winner-take-all economic incentives. The result is in equal parts riotous humor and a capsule of deep insight. Definitely the funniest thing about Frankenstein I have read. 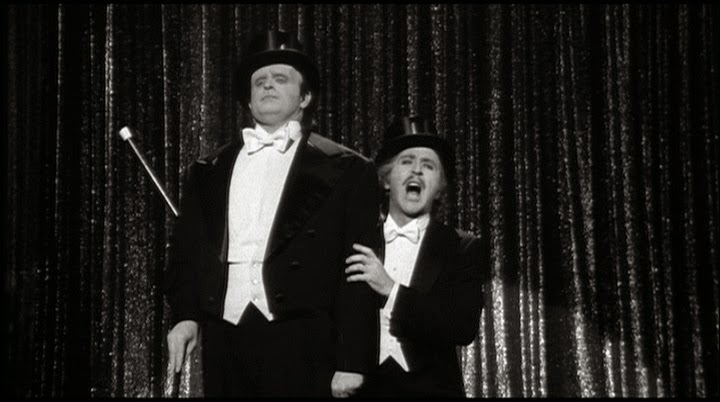 "I find it profoundly ironic that the very fallibility of science that motivated Mary Shelley to write Frankenstein – people’s tendency to believe they understand things when they actually do not – should become mainstream and acceptable for financial reasons. It brings to mind Oscar Wilde’s observation that the lack of money is the root of all evil. One can just imagine what Mrs. Shelley’s novel would have been like had it been written today. Instead of an angst-ridden nerd from Geneva, Victor Frankenstein would have been an enterprising young spam profiteer from the Thomas Jefferson High School of Science and Technology in Alexandria, Virginia. Instead of traveling to Igolstadt to learn his highly creative surgical techniques, Victor would have flown to Boston to attend Harvard Medical School – after a four-year hiatus at Princeton investigating tennis and women. Instead of constructing the monster in secret he would have used political connections to obtain a stupendous grant from the National Institutes of Health, then set up shop in Bethesda and floated a massive initial public offering. Instead of reviling his creation he would have plastered it on fliers touting his innovative technical breakthrough and announcing the launch of a new longevity clinic. The monster, meanwhile, forsaking a murder rampage as insufficiently destructive, would instead write a best-selling trash novel, appear on Oprah, and run for governor of California. Victor himself would not seek death on the ice floes of the Arctic but would look forward to a morally and financially untroubled retirement in Palm Springs as soon as his lawyers got rid of those meddlesome do-gooders from the Securities and Exchange Commission." "Science is a very human form of knowledge. We are always at the brink of the known; we always feel forward for what is to be hoped. Every judgment in science stands on the edge of error and is personal. Science is a tribute to what we can know although we are fallible. In the end, the words were said by Oliver Cromwell: "I beseech you in the bowels of Christ: Think it possible you may be mistaken." 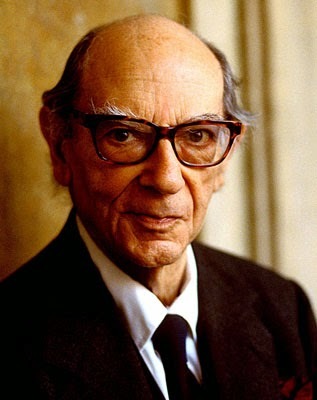 The great philosopher of ideas Isaiah Berlin delivers that last message to us from the grave with resounding sincerity in an article published by the New York Review of Books which reprints Berlin's 1996 address as commencement speaker at the University of Toronto. Berlin lived from 1909 to 1997 and he is most widely known to the public as the originator of the distinction between hedgehogs and foxes. But he was also recognized as one of the most thoughtful thinkers and writers of his generation, and because of his long life and wide-ranging intellect was in a good position to catalogue the horrors of the entire century and distill their central message. That central lesson, as Berlin puts it, is the gospel of the one unalterable truth, the meld of sacred values that one must pursue at the expense of everything else. That gospel is hardly new - men have pursued it to nefarious and tragic ends for centuries - but it saw its most horrific culmination in terms of scale and purposeful slaughter in the crimes of the twentieth century. If you are truly convinced that there is some solution to all human problems, that one can conceive an ideal society which men can reach if only they do what is necessary to attain it, then you and your followers must believe that no price can be too high to pay in order to open the gates of such a paradise. Only the stupid and malevolent will resist once certain simple truths are put to them. Those who resist must be persuaded; if they cannot be persuaded, laws must be passed to restrain them; if that does not work, then coercion, if need be violence, will inevitably have to be used—if necessary, terror, slaughter. Lenin believed this after reading Das Kapital, and consistently taught that if a just, peaceful, happy, free, virtuous society could be created by the means he advocated, then the end justified any methods that needed to be used, literally any. The embrace of any kind of means as justification for ends is hardly Lenin's invention, and we can be sure that men will continue to wield this fatal idea. But there is an even more fundamental reason why such ideas are dangerous. It's not just the lives they take, but the inherent flaws they present. Here Berlin reminds us of the essential role that pluralism has played in human history, a philosophy that he himself did so much to expound on. This is the idea of which I spoke, and what I wish to tell you is that it is false. Not only because the solutions given by different schools of social thought differ, and none can be demonstrated by rational methods—but for an even deeper reason. The central values by which most men have lived, in a great many lands at a great many times—these values, almost if not entirely universal, are not always harmonious with each other. Some are, some are not. Men have always craved for liberty, security, equality, happiness, justice, knowledge, and so on. But complete liberty is not compatible with complete equality—if men were wholly free, the wolves would be free to eat the sheep. Perfect equality means that human liberties must be restrained so that the ablest and the most gifted are not permitted to advance beyond those who would inevitably lose if there were competition. Security, and indeed freedoms, cannot be preserved if freedom to subvert them is permitted. Indeed, not everyone seeks security or peace, otherwise some would not have sought glory in battle or in dangerous sports. Justice has always been a human ideal, but it is not fully compatible with mercy. Creative imagination and spontaneity, splendid in themselves, cannot be fully reconciled with the need for planning, organization, careful and responsible calculation. Knowledge, the pursuit of truth—the noblest of aims—cannot be fully reconciled with the happiness or the freedom that men desire, for even if I know that I have some incurable disease this will not make me happier or freer. I must always choose: between peace and excitement, or knowledge and blissful ignorance. And so on. It is the inability to grasp this fundamental tussle between different values that in part leads people to believe in holy truths. But Berlin is honest and reflective enough to admit that he sees no straightforward solution to this dilemma. This is perhaps because the only solution is to admit the dilemma and live with it, to respect a plurality of opinion and abide by the views of multitudes, to recognize that the contradictions that man presents are the contradictions that man contains. In fact this reconciliation with differing views lies at the heart of both liberal democracy and scientific exploration. Science has always prided itself on respecting a plurality of views, perhaps because its practitioners have realized how fickle pronouncements of ultimate truth are. At the end of the nineteenth century a few leading physicists declared that fundamental physics was now set in stone and all that was needed was the drive toward more accurate measurements. The world of relativity and quantum theory shattered that fond illusion. Similarly many experts in evolution believed that the genome was unalterable once it was passed on from parents to children. The discovery of epigenetics put a completely different spin on genetic inheritance. The same slaying of longstanding beliefs - Aristotle's four elements, vitalism, the ether - has pervaded the history of science. It is thus clear that science has always suffered when its adherents have insisted that there was one truth to be known, shared and cherished. But it - and humanity - have suffered even more when the belief in such a truth came not from the scientific edifice itself from but from a political or social outlook that used that edifice to its own ends. The greatest harm comes not when scientists claim universal truth but when all of us, scientists as well as non-scientists, believe that science should support what we believe are sacred political or social values. That is why I find myself troubled by what I see as the misuse of science and facts by both the left and right in this country and in other lands. The bedrock of presumed certainty in what one sees as "hard data" not only roots one's beliefs in sacred values but it often simply precludes one from understanding subtleties and rationally responding to arguments on the other side: in other words it stops otherwise intelligent people from thinking. For instance the sad thing about the tiny vocal minority that expressed real or perceived outrage about some of my recent posts was not the outrage itself - outrage has been wielded as a public instrument since prehistoric times and has now probably replaced baseball as the national pastime - but the remarkable fact that none of these so-called "critics" actually replied to the points in the posts with any amount of detail. All that was left at the end was smoke without fire, cries and smoldering fury without a modicum of enlightenment. Consequently the outrage experts simply moved on to another outrage without either disseminating or imbibing any measurably useful knowledge, and the pattern repeated. The overwhelming emotion I felt for this minority was pity, but the real sense I had was one of missed opportunity; I understood that neither their outrage nor my pity promoted understanding. Many others (gratifyingly a much larger number than the minority) who wrote to me disagreed with points made in the posts, but unlike the others they were reasonable and civil, thought that the consequences of the whole episode were eminently silly, pointed out disagreements where they thought they existed, responded to detail with detail and most importantly, pointed out common ground. That is how a conversation should proceed in the age of Twitter - without Twitter. This knee-jerk disapproval manifests itself on both sides of the political aisle. The right deplores global warming because it is inimical to its political agenda, the left holds the science of global warming perfect and sacrosanct because saying otherwise would be inimical to theirs. The right believes that some people are actually superior or inferior to others and twists the science of genetics, race and IQ to that end. The left fears this viewpoint so much that it gropes for support for the equality of all men in science, even when science and human value systems should really be kept separate from each other. The right looks into science for the contention held by some of its members that one gender is inferior to the other. The left is so fearful of this contention that it is quick to interpret any studies demonstrating even subtle or uncontroversial gender differences as evidence of discrimination against one gender or another. Generally speaking, the right is quick to point out differences rather than similarities while the left is quick to assume that pointing out differences is tantamount to pointing out inferiority or superiority. The left's sacred value is equality, the right's is God and country. As someone who grew up with liberal, free-thinking values I myself am more partial to one of these viewpoints than the other, but in reality we should regard both of them as flawed. In my opinion both pose barriers to the honest gathering of knowledge. I believe it is folly to look to science as a source of human values. Occasionally science may support what we see as proper values, but I do not think it is wise to constantly fall back on science for justification for what should be uniquely human moral and social principles. For instance if tomorrow a specific case study from the animal kingdom provides support for democracy or feminism or opposition to misogyny, well and good. But what if another case study demonstrates the opposite? Would we then abandon our values or regard them as dubious because they are not mirrored in the raw facts of the natural world? Every stripe of liberal would reject that contention, and conservatives should reject it too. Although it is often difficult to separate science from morality, it is wise to constantly strive to do so since science respects no human decisions and follows no social trends. What, then, are scientists to think about the complex world of human values? The simple answer is that they should realize the limitations of their methods and understand that even though detailed knowledge of one aspect of the scientific world or another may make them experts in certain fields, it still does not make them experts in using these aspects to gain detailed insight into human affairs. At best their knowledge of these facts makes them valuable advisors, but it makes them no wiser as arbiters of social goods and evils than other non-scientists. A good example is the case of nuclear scientists whose insights into atomic weapons made them uniquely positioned to offer advice to governments at the end of World War 2. But even their expertise in these scientific matters did not make them any more qualified to make expert decisions on the moral issues that the world confronted because of these weapons. Richard Feynman perhaps summed it up best with his pithy statement, "When I am asked to give advice about a non-scientific issue I am no smarter than the guy next to me." Like good citizens scientists should of course hold forth on such issues as much as anyone else, but they should do so only as non-scientists who have been informed a little better than their fellow thinkers, not as experts whose insights into these matters are privileged because somehow they seem to be mirrored in or rejected by their science. It seems to me that when applied to scientists themselves, Berlin's admonition about the dangers of certainty lies not in believing in certain truths about science itself - most scientists are well-versed with the scientific method to know that the norms of scientific truth keeps on changing - but to use science as justification for their moral certainty. The moral certainty itself may or may not be valid depending on the context, but it's misguided and often dangerous to root that certainty in the ever-shifting sands of scientific facts. Human values are too precious to be left to science. The twentieth century should send out a deafening message to that effect. A few days ago I was reading the fine biography of the Caltech chemist Ahmed Zewail who won the 1999 Nobel Prize in chemistry for his wonderful work on laser femtosecond spectroscopy which allows us to literally peer into the secret lives of molecules. The book and the associated Nobel Prize website biography are instructive because they document in fond detail the inculturation of a highly talented and aspiring immigrant in the United States - an experience that has been shared by hundreds of millions of people since the founding of the Republic. As Zewail details however, applying deeply ingrained, familiar-as-day cultural quirks in a new environment is not always successful. "Arriving in the States, I had the feeling of being thrown into an ocean. The ocean was full of knowledge, culture, and opportunities, and the choice was clear: I could either learn to swim or sink. The culture was foreign, the language was difficult, but my hopes were high. I did not speak or write English fluently, and I did not know much about western culture in general, or American culture in particular. I remember a "cultural incident" that opened my eyes to the new traditions I was experiencing right after settling in Philadelphia. In Egypt, as boys, we used to kid each other by saying "I'll kill you", and good friends often said such phrases jokingly. I became friends with a sympathetic American graduate student, and, at one point, jokingly said "I'll kill you". I immediately noticed his reserve and coolness, perhaps worrying that a fellow from the Middle East might actually do it!" I morosely wonder how this kind of a friendly retort might go down worse today in a post-9/11 world where fear of perceived entities continues to be sold to us by politicians and the media with copious mass appeal; I wonder if someone would be bull-headed enough to ignore such cultural differences and go straight to the authorities. Along the same lines I wonder how those famed World War 2 European emigre scientists, arriving here by the boatloads from openly fascist countries, might have fared in 2014. I ardently hope their experiences would have been the same; no exaggerated fear of anything real or perceived comes anywhere close enough to deny this country the kind of immensely enriching experiences and dominance in science and other fields that amazingly talented immigrants like Zewail, Fermi, Weisskopf and Chargas have brought. Freeman Dyson who is a hero of mine and who I have had the privilege of meeting at length several times is someone who has done a lot of interesting things during a long and fruitful life. Not only has he made brilliant, foundational contributions to many areas of mathematics, physics, engineering and astronomy but he has also written books showcasing elegant, wide-ranging, poetic prose. If you look at Dyson's astonishingly diverse writings or talks it is easy to mistake him as a philosopher of science, a big picture thinker striding on the widest possible canvas. But as he himself said to me during a long, one-on-one, intellectually sparkling lunch discussion last year, a lot of people think that talking about the big picture automatically makes one a philosopher. Dyson has indeed written about an amazing variety of big picture topics, from the origins of life to the colonization of space. But he also maintains that he has always been first and foremost a problem solver, someone who is much more interested in details than in grand theorizing. Whatever philosophy he manages to weave is built on a foundation of solving specific technical problems. This is partly evidenced by his work on highly technical engineering projects ranging from nuclear spaceships to nuclear reactors. This quality would make Dyson quite comfortable in the company of chemists, since chemistry by its very nature is more a problem-solving discipline rather than a philosophical pursuit like cosmology or evolutionary biology. I was curious to know Dyson’s views on chemistry since while he has had thoughts on almost every imaginable topic, I could not really find anything by him on chemistry except for a review in Physics Today of Nobel Laureate Roald Hoffmann’s fine book “The Same and Not the Same”. …I learned chemistry from Christopher Longuet-Higgins who was already much more of an expert and more excited about chemistry than Eric James (Dyson’s chemistry teacher at Winchester College). And I remember Christopher bringing to Winchester some crystals of stannic iodide which he had made, which is the most marvelous stuff. It is a brilliant scarlet colour and it makes these beautiful scarlet crystals, and they’re also extremely heavy. If you have a little bottle full of it, it feels like lead. So that kind of chemistry I found delightful, just the sort of details of the actual stuff, rather than the theory that lay behind it. So there, I think Dyson would have felt right at home as a chemist. Chemists revel in solving particular problems. It’s not that they don’t care about general principles. Every once in a while someone like Linus Pauling or Alfred Werner comes along and ties together disparate threads into a neat superstructure. But the vast majority of chemical work consists of celebrating the diversity of structure and function inherent in natural and synthetic molecules. The point Dyson makes is an obvious and important one that is often lost among the clichéd caricatures of chemists bubbling frothy liquids and crystallizing colorful solids that one often sees in literature and cinema. But it’s precisely these bubbling liquids and colorful solids that endow chemistry with a palpable reality that’s often missing from more theoretical sciences. A personal digression. I remember an episode from an undergraduate chemistry lab where we were supposed to estimate two unknown metal ions from a solution. After trying out every test in the book we could only detect copper. The other ion remained a mystery and we finally threw up our hands. That’s when the instructor revealed his trick. It turns out that the method of copper estimation that we were using involved turning the solution highly acidic with hydrochloric acid. With a smile on his face, the instructor put a single drop of the concentrated acidic solution in a large flask and then filled the flask to the brim with water, diluting the initial solution by at least a factor of ten thousand. Our eyes were glued to the flask as he passed hydrogen sulfide gas into the solution. And then, starting from the bottom and rising to the top, the flask filled up with the most beautiful yellow color that I have ever seen; it’s a sight that I will never forget. What happens is that cadmium is precipitated as cadmium sulfide only in dilute acidic solutions while for copper it’s the opposite. All our tests for detecting copper in concentrated acid missed the hidden cadmium, until it was ready to be unmasked by simple dilution. 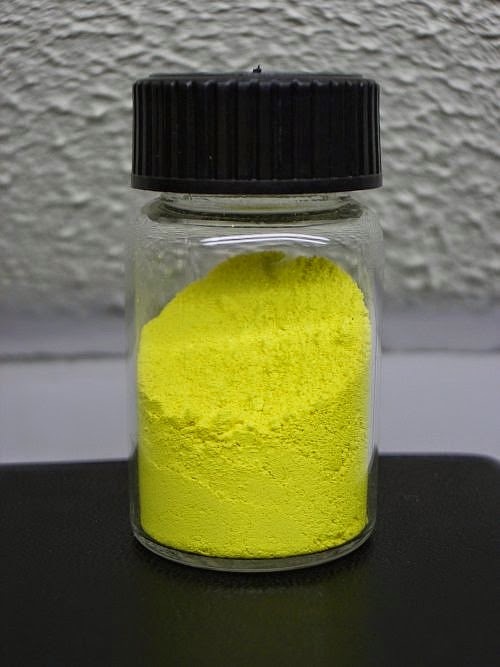 Every chemist is familiar with this feeling of discovering something unknown, no matter how trivial or important, that actually exists; all the better if it has a brilliant scarlet or full-throated yellow color, as is often the case in chemistry. Dyson is right that there is something unmistakably reassuring, in-your-face - real – about holding a vial of something that was previously considered impossible. FIRST, because by and large, mathematics lacks the sensuous elements which play so large a role in my attraction to chemistry. I love crystals, the beauty of their form- and their formation; liquids, dormant, distilling, sloshing! ; the fumes; the odors- good and bad; the rainbow of colours; the gleaming vessels, of every size, shape and purpose. Much as I might think about chemistry, it would not exist for me without these physical, visual, tangible, sensuous things. Woodward’s second reason for studying chemistry goes to the heart of the nature of empirical science, what Richard Feynman called “imagination in a straitjacket”. It’s a philosophy that drives all of science including the most rarefied theoretical ideas. Physicists often like to tell the story of how Einstein felt that “something had snapped inside” him when he saw the predictions of general relativity confirmed by observations of the perihelion of mercury. He surely must have felt the rare, once-in-a-lifetime satisfaction of a great theoretical construct being validated by a real observation that could be boiled down to a single number. We tend to think of Einstein as the great scientist-philosopher, but there he was, being ecstatic about a technical detail that was a crucial part of his magnum opus. Observing barium xenate or precipitating cadmium is not quite as momentous as confirming the theory of relativity, but I can readily imagine feeling a shiver down my spine if I had been presented with that sort of chemical evidence. Evidence that seemed to defy the impossible but which I could nonetheless hold in my hand and keep in my closet. That’s the joy of chemistry. This is an updated version of a previous post on Scientific American. The name of David Greenglass must have almost completely faded from memory for people of my generation. Greenglass himself probably wanted his name to fade from all of history, although history is seldom so kind. The fact remains that not only did he spy for the Soviet Union on the Manhattan Project but he also likely betrayed his sister and sent her to the electric chair. Greenglass who died quietly on July 1 at age 92 in a nursing home was the atomic spy who ferried secrets from Los Alamos to his sister and her husband, the infamous Rosenbergs. His obituary in the NYT appeared yesterday and it's interesting not only for the bygone era that it evokes, but even more so because it eerily comes on the heels of another article from the NYT two days ago, this one documenting the release of the complete transcript of Robert Oppenheimer's 1954 security hearing. In death Greenglass and Oppenheimer strangely join hands in teaching all of us some valuable lessons. Their stories are both instructive tales of misguided priorities and the kind of paranoia and intolerance of freedom of expression that war and peace can both engender. 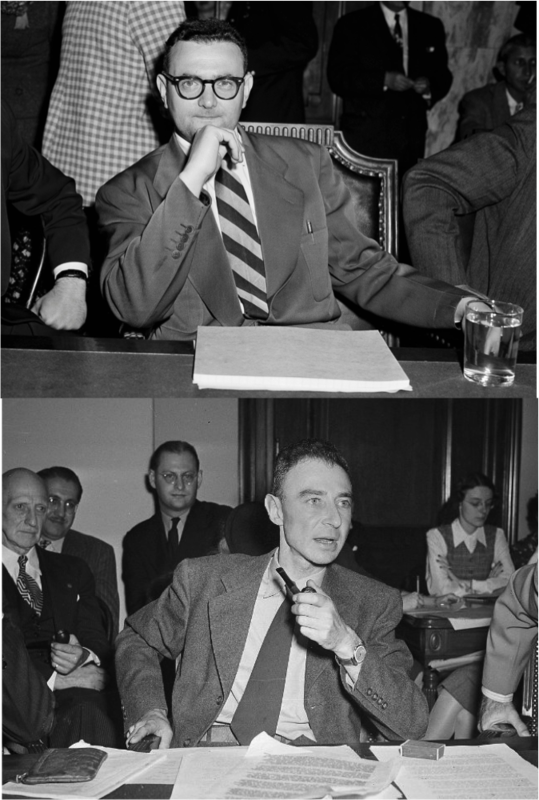 The reason why the simultaneous appearance of stories about these two men is so striking is because it reminded me of one of the greatest ironies of the Manhattan Project: the fact that in spite of what was considered watertight security, Klaus Fuchs and David Greenglass were literally carrying out secrets of the highest importance through the front gate while the director of the project had his phone tapped and was being interrogated about past communist "associations". A greater misapplication of the security apparatus has seldom manifested itself. Greenglass and Fuchs both gave away key secrets on the implosion design of the plutonium bomb - the only real secret as such that the project unearthed - and they did this under the noses of what was supposed to be one of the most sophisticated and tightly controlled security organizations on the face of the planet. Greenglass's life also indicates how sometimes the most ordinary of men can acquire extraordinary significance in the annals of history: Greenglass was a rather lowly machinist, by all accounts not a very intelligent and well-educated man, who by sheer luck ended up in Los Alamos via Oak Ridge, TN. When his brother-in-law Julius found out where he was working he must have drooled at the possibility of getting his hands on crucial atomic information for the Soviets. Julius convinced Greenglass's sister Ethel to convince her brother to pass on secrets, all in the name of camaraderie with Uncle Joe of course. After the war, when Klaus Fuchs who was the really significant spy confessed, he implicated Harry Gold, the courier who was the go-between between the Rosenbergs, Greenglass and Fuchs. Gold in turn implicated Greenglass and the Rosenbergs. In 1951, in a kind of plea bargain which would spare his wife and give him a lenient sentence, David Greenglass took the stand against his sister and his testimony played an important part in ending the life of this mother of two. The real sinner seems to have been Julius, and how much Ethel really knew has been debated to this day. Nonetheless, it's clear that the Eisenhower administration wanted to make an example of the Rosenbergs so they were executed in the face of public protests in June 1953. In contrast the far more significant spy, Klaus Fuchs, was released after a mere nine years. One wonders how heavily his role in his sister's execution must have weighed on Greenglass's mind for the ensuing 60 years in that obscure nursing home. Just a year later the monstrosity that was Cold War paranoia brought about the downfall of Robert Oppenheimer. In what will always be a black, shameful blot on the political history of this country, paranoid right-wing enemies of Oppenheimer had the government conduct a security hearing which interrogated Oppenheimer with the zeal of the Inquisition. In a blatantly unconstitutional travesty of justice his phones were tapped and his lawyers were denied access to critical information under the pretext of national security. The father of the atomic bomb, a man who had given so much to his country and whose actions rendered him far more patriotic than those who were accusing him, left the hearing with his security clearance taken away and his spirit broken. The recent NYT article tells us what we knew for 60 years, that Oppenheimer was wholly loyal and exhibited no more than a sensitive liberal's awakening to experiments with different political philosophies. That it took the government 60 years to reveal the blindingly obvious is an indictment of a system of secrecy and classification which has fed upon itself for so long. Like Shakespeare's tragedies the stories of both these men are timeless and speak to the ages. Just like it spied on Oppenheimer while letting Greenglass get away, the national security apparatus as revealed by Edward Snowden today spies on innocent people while letting the real criminals get away. Just like McCarthy and his acolytes interpreted disagreement with disloyalty, so do today's political extremists equate disagreement with bigotry and treason. Members of both the right wing and the left often squelch dissenting opinion, either through official or legal means or more commonly through creating enough public outrage so that the opposition is silenced. Both public and private organizations worry about political correctness far more than they do about diversity of opinion. It is easy enough to extol freedom of speech on paper but much harder to uphold it in practice. Especially when it applies to others. This won't do. In death David Greenglass and Robert Oppenheimer once again remind us of the pillars which should uphold a liberal democracy that prides itself on freedom of speech, and this is a lesson that we should take to heart. The age of McCarthy is always closer than we think. Who's the world's greatest living chemist? Since we have been making lists of Nobel Prize candidates for the last few weeks and since we already have a few lists of "greatest chemist in history", I thought I would ask for a different kind of selection: Who would be a candidate for the title of 'greatest living chemist'? Now I would be the first one to admit that any kind of 'greatest' list is always fuzzy and subjective, partly because the meaning of 'greatest' can be highly subjective and controversial. But in this particular case I am thinking of criteria that should be generally acceptable. I also realize that I making this list is like a mouse making a list of the world's most eminent cats, but since there are always more mice than cats and the cats don't usually bother to make such lists themselves I think that's ok.
To begin with, the candidate should be a top-notch scientist since otherwise there wouldn't be a point to that word 'chemist' in the title; to gain an idea of who such people may be it might be instructive to run down the list of Nobel Laureates in chemistry or Priestley Medalists. But simply doing outstanding chemistry is not enough since most of us realize (or should realize, ideally) that there is more to good science than just doing good science. With this in mind I am thinking of some other criteria that would qualify someone for that title: for instance; an excellent teaching and mentoring record, memorable contributions to chemistry education and significant service in terms of chemistry outreach. That last bit is important and involves things like serving as editor of a major journal, popularizing chemistry or the cause of chemistry and chemists through popular literature and public talks and serving on official commissions, societies etc. Also, it goes without saying that the greatest living chemist is bound to be an older person since even brilliant younger people simply haven't had the time to make such sweeping contributions. This is one of those few times when 'distinguished and gray' would be preferable to 'young and swashbuckling'. So without further ado, here is a very personal (and short) list of people I would consider good candidates for the title of 'greatest living chemist'. 2. E. J. Corey: Woodward's Nobel Prize-winning heir in the field of synthetic organic chemistry. The man is a legend in the universe of reagents and products, and for good reason: There is not a single academic, government or industrial laboratory in the world that does not use a synthetic approach developed by Corey's group. When it comes to practical organic chemistry, his achievements to the field surpass that of anyone else, probably including Woodward. Corey has also been a phenomenal and unsurpassed trainer of chemists, having trained over a hundred graduate students and two hundred postdocs; his extended family now occupies the nooks and crannies of almost every major chemistry institution. Sadly his career has been marked by a few graduate student tragedies, but in my book the balance of his contributions still eminently marks him as a candidate. 3. 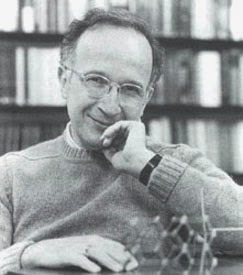 Roald Hoffmann: Hoffmann won the Nobel Prize in 1981 but as evidenced just by the list of papers he co-authored this year, he is still making solid contributions more than 30 years later. Hoffmann is also one of those few chemists who seems to be knowledgable in almost every theoretical aspect of the subject; over the years he has authored papers on diverse chemical species ranging from unstable ions to extended inorganic lattices to metal-organic frameworks. But what really marks him apart for me are his efforts in the service of the public understanding of chemistry. He has done more to popularize the cause of chemistry and to communicate the essential philosophy of the subject more than any other chemist of his caliber (I reviewed his latest collection of essays here); also importantly, he hosted the TV series "The World of Chemistry". In addition he is a notable playwright and public speaker, and since 2001 has hosted a science cafe in New York City which explores connections between science, art and poetry. These key public achievements, in addition to his prolific chemistry research, catapult Hoffmann to the top of the list on my opinion. 4. Carl Djerassi: Hoffmann's partner in crime when it comes to writing plays and novels, Djerassi has not been any less prolific even though he has given up actual research for a while now. He is of course best known as the father of the pill, and the social and cultural impact of this invention simply cannot be overestimated. In addition he rivals Hoffmann in conducting public readings, writing plays and giving talks on chemistry. His two memoirs ("Steroids Made it Possible" and "The Pill, Pygmy Chimps and Degas's Horse") are eminently readable. Definitely a worthy candidate. 5. 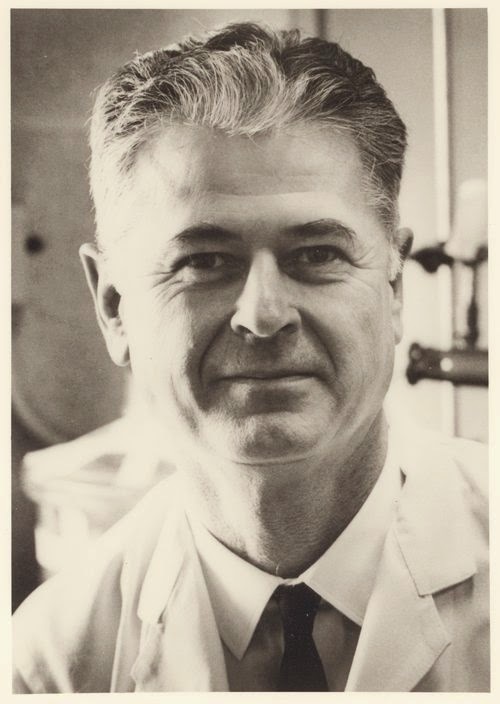 George Whitesides: Whitesides is another chemist whose sheer diversity of research may be unparalleled. His lab has worked on everything from the solution structure of lithium cuprates to NMR spectroscopy to scenarios for the origins of life. He has also trained an impressive number of chemists. But Whitesides is also hugely influential on the national and international chemistry scene. He has advised presidents and served on important commissions. Most importantly, his contributions to the cause of chemical education have also been notable. With Felice Frankel he authored a lavishly illustrated book on science at the nanoscale. He has written a highly cited article on how to write a scientific paper. And as I have mentioned in a few posts, many of his review articles go to the heart of what directions chemistry should take and how chemists should communicate the importance of their science to the public. Whitesides is as good a candidate for our title as anyone else. 6. Ronald Breslow: It must not have been easy being Ron Breslow during the last few years. But it shouldn't have been too hard either. If we are really talking about all rounders then Breslow may possibly top the list. As a researcher his fame - dinosaurs notwithstanding - is enormous and wholly well-deserved. He has won almost every prize out there. In addition he has mentored outstanding students who now occupy the leading centers of academic chemistry around the country, and one of them has even won a Nobel Prize. As if all this were not enough, Breslow has served as President of the ACS and has co-authored important official reports about chemistry and chemical education. For his tremendous work as a scientist and all-round educator I think Breslow should be on the list. So that's my short selection of people for the title of 'greatest living chemist'. Other potential names on the list would be Allen Bard, Jacqueline Barton, Richard Zare, Jack Roberts, Harry Gray, Ken Houk and Martin Karplus. All of these folks demonstrate some notable combination on top-notch research, high quality mentorship and chemistry service and outreach. All of them and more are eminently deserving, but if I had to really pick one as a personal favorite I would pick Roald Hoffmann. To me his prolific chemical output combined with his passion for exploring the interaction of chemistry with art, poetry and philosophy and then actually communicating these interactions to the public through books and talks set him apart. A rare breed of scientist. Offer your own suggestions in the comments section!